It’s the last Saturday of the month, which means it’s Give a Sh*t Book Club time! This month’s selection is White Rage: The Unspoken Truth of Our Racial Divide by Carol Anderson, and holy cow is it an important book that I think everyone should read. What was most useful about White Rage to me is how it traces the systematic oppression of black people throughout our American history. It exposes the patterns that have repeated over and over since before our country was a country. The day-to-day news stories don’t give us the big picture; they can’t contextualize the forces behind the headlines. Without context, a police officer murdering an unarmed black man (or child) can seem like an isolated incident, when it is anything but. This book helped me see the collective resentment many white people have towards black people, and how it has been passed down like a legacy to each new generation. I have seen evidence of this resentment in my life, but as it’s often veiled in neutral-sounding language, I didn’t know what to call it and couldn’t necessarily articulate why it made me feel squicky when I encountered it. Because yeah, those white men in power we’ve collectively put on a pedestal as super-principled, good-hearted allies to the people our country enslaved for generations? They weren’t as saintly as I thought they were. Abraham Lincoln was not out banging the drum for integrating former slaves into society and granting them full rights of citizenship and a voice in government. And the stuff about Ronald Reagan? I still don’t know what to say about it or where to start. I knew Reagan was a bad president whose heartless policies hurt a lot of people, but OH MY GOSH the depth of depravity and the utter brazenness of the Contra situation…I’m staggered. It weighs on me that I had never bothered to read and learn about this part of our relatively recent history. How discouraging to realize the power and reach a bad president has, and how the effects of his time in office stretch on long past his tenure. The Supreme Court justices appointed by Reagan and the subsequent decisions outlined in the book…the impact on people’s lives is unconscionable. It makes me tremble for our future, now that we have an even looser cannon in the White House and an attorney general who wants to bring back Reagan’s hypocritical, self-created War on Drugs. Speaking of elected leaders, my mind was totally boggled by the creativity of white men in power to find ways to keep black people down. When one method was thwarted, they’d come up with another, and in recent years have learned to disguise their tactics with innocuous language. No more slavery? Fine, we’ll make sure black citizens can’t own property or vote. Blacks leaving the South in droves for better-paying jobs up North? Fine, we’ll stop the trains or jail them for vagrancy. Unprecedented numbers of minority and low-income voters showing up to the polls to elect Barack Obama? No problem, we’ll require government-issued ID to vote and then make sure the offices issuing those IDs are only open one a day month (and we’ll call it “preventing voter fraud” to hide our racist objective). Dear Lord. Imagine if all that energy were spent on creating good policy that helps citizens! 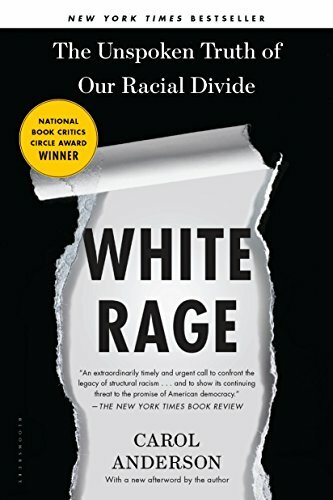 So what did you think of White Rage? Comments are open below. I look forward to hearing your thoughts!